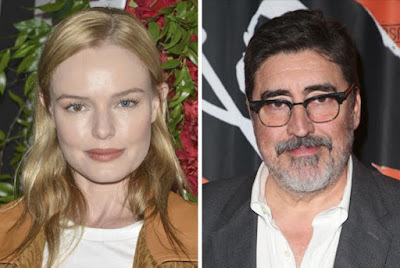 Kate Bosworth (Still Alice, 21) and Golden Globe® Nominee Alfred Molina (Secret in Their Eyes, Spiderman 2) have joined the cast of "The Devil Has a Name" directed by Edward James Olmos, who will also star alongside David Straithairn (Good Night, Good Luck). The drama is fully financed and produced by Steve McEveety, Patrick Hibler and Rob McEveety of True Navigator Pictures. Storyboard Media is handling worldwide sales and will introduce the film to buyers in Berlin. Principal Photography starts today in Los Angeles. Written by Rob McEveety and inspired by true events, the film centers on an unhinged oil baron who gets in a bruising standoff with a stubborn farmer after the water on his farm was poisoned by her company. Bosworth leads in the role of “Gigi Cutler,” the regional director of Shore Oil and Gas. Gigi is the absolute master of her domain. Arrogant and ambitious, Gigi’s failure to cover up the pollution of the farm has curbed her climb up the corporate ranks and left her open to a coup by her vicious colleagues. Molina plays “Big Boss,” Shore’s psychopathic CEO in Houston, who wants to bring Gigi down before she’s in a position to take his job. Bosworth made her feature film debut in Robert Redford’s The Horse Whisperer at the age of 14, and shot to stardom a few years later in cult-classic, Blue Crush. She has since starred in a range of critically-acclaimed roles including ‘Lois Lane’ in Superman Returns; ‘Sandra Dee’ in Beyond the Sea; Still Alice with Julianne Moore; 21; most recently the award-nominated miniseries, The Long Road Home. Molina recently received a Golden Globe® Nomination for his role on Ryan Murphy’s “Feud” starring Jessica Lange and Susan Sarandon. Addition film credits include Whiskey Tango Foxtrot, starring Tina Fey and Margot Robbie for Paramount Pictures; Billy Ray’s Secret in Their Eyes, alongside Nicole Kidman and Julia Roberts; and the critically acclaimed romance Chocolat, directed by Lasse Hallström and starring Juliette Binoche and Jonny Depp. Bosworth is represented by CAA and Management 360. Molina is represented by Hyler Management. True Navigator is a film, television and new media production company comprised of experienced individuals who have worked in a wide variety of positions within the entertainment industry. The company is not only dedicated to producing high-quality and commercially appealing projects for a global audience, but it is also focused on enabling aspiring creatives to grow in an industry with a challenging barrier for entry.